A quote that was given to me by my Tae Kwon Do instructor over 20 Years ago, and holds true to my philosophy of life to this day. A quote that represents self-leadership and true empowerment, leads to the indomitable spirit that we as Americans hold dear. Though the quote comes from a Czech historian from the mid to late 19th century, it is a cornerstone of man’s striving for self-actualization, seen in many philosophies throughout the millennium. The first time I felt in years that this Philosophy has not been lost and it continues to be passed on to our youth. I enrolled my two youngest girls 4 and 6 years old in Master T’s class recently. After a Month, I felt that he did such an excellent job; I enrolled my eldest daughter 13 and myself. My wife came out to the watch my first class and the next day she expressed her enthusiasm to join, as soon as she could shuffle her schedule. There are not a lot of adults in the class as it stands, but maybe my wife and I joining will start a trend as it is a good feeling to embark to get healthy. It is also good when your children see what leadership is through action not just words. During our years at T’s Karate, Dalmir and I have learned so much from Master Kevin Tolderlund. Master T has had such a lasting impact on both me and my brother. Master T goes above and beyond to make our studio a family, and it shows. At T’s, we are a tight-knit community that cares for each other and that pushes each other to the best of our abilities. Master T is always there for us. He truly makes the studio a comforting place to learn and to grow, and I couldn’t be more grateful for such an incredible instructor and amazing studio. of Tang Soo Do has had tremendous influence on Joey and others in his class. Master T’s instructional classes are fair, proficient, focused,inspiring, and dedicated to everyone who participates. The instructionand training that Joey has received from Master T has helped his strength, confidence, knowledge, and understanding of the fine art of Tang Soo Do. All this would not have been possible if it wasn’t for the dedication and knowledge from Master T. All students strive for excellence and achieve the goal that are set forth by themselves and Master T. The confidence and strength building has made Joey and other in his class become more focused, educated and influenced in their everyday lives. Master T not only teaches the art of Tang So Do, but he teaches life lessons so each person can achieve the greatest inner strength that will not only make them a great Tang So Do student, but also a stronger induvial person. 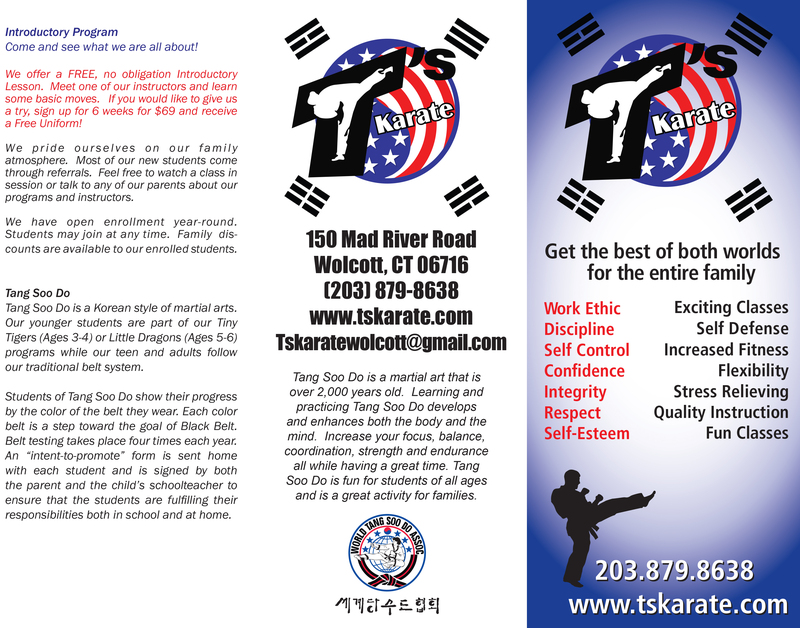 Any level of acknowledgement and recognition for T’s Karate is well deserved and respected. I couldn’t help but notice how much the Tang Soo Do Martial Arts discipline has changed my daughter’s life. She has such a different attitiude once her Gi and belt are upon her body. Listening to her talk about the amount of respect that she has for her Master made me so proud. She then followed up that comment with I hope that I can be as good as her…..Her??? It was then that it hit me that she is not just learning Respect, Humility and Self Discipline from her Master alone, who… please make no mistake, is the rock and foundation in her life that instilled these virtues from the first day she stept foot in his Dojo. Yet she spoke of another–“Her”…Someone whom she respects and whom by example of their mutual Master has shown this 14 year old girl what it means to have character, leadership and peseverance and how to fight and express her discipline with creativity and humility and honor!! Something this woman does effortlessly everyday when she puts her own black belt on. This “Her” has a name and a face and it is Noelle Thompson Bates —-Noelle I can’t thank you enough for your dedication to this Art but to your support and guidance that you give to the young people who are in complete awe of you and look up to your mentorship. My child and ….oh heck me included!!! T’s Karate is lucky to have you—Thank you!!! Tang Soo!! !